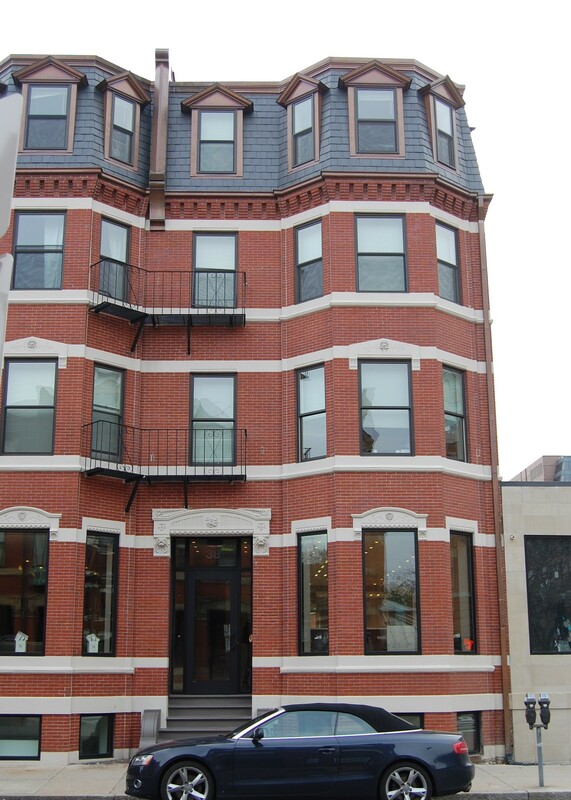 38 Fairfield (235 Newbury) is located on the NE corner of Fairfield and Newbury, with 36 Fairfield to the north, 240 Newbury to the south, across Newbury, 231 Newbury to the east, and 37 Fairfield (239 Newbury) to the west, across Fairfield. 38 Fairfield (235 Newbury) was built in 1878-1879 for banker and real estate investor Asa Perkins Potter, one of eight houses, four on each side of the block: 32-34-36-38 Fairfield on the east and 31-33-35-37 Fairfield on the west. He and his wife, Delle (Sheldon) Potter, lived at 29 Fairfield, built at about the same time. Each block of four houses was designed as a symmetrical group, centered on the paired entrances to the middle houses (34-36 Fairfield and 33-35 Fairfield). It appears likely that the eight houses originally matched in design, all with bays topped with conical roofs. 31-33-35-37 Fairfield remained unchanged as of 2015, but 32-34-36-38 Fairfield were significantly altered. Additional floors were added very early to 36 and 38 Fairfield, inasmuch as they appear as three story houses on the 1887 Sanborn map, whereas 32 and 34 Fairfield (and 31-33-35-37 Fairfield) are described as 2 story houses with French roofs. They are similarly described on the 1897 Sanborn map. Based on similar information on the Bromley maps, the additional story at 32 Fairfield was added between about 1908 and 1912. The additional story at 34 Fairfield was added sometime after the early 1940s, with a remnant of the original roof retained. The original permit applications for 32-34-36-38 Fairfield have not been located. The permit application for 31-33 Fairfield (one application for two houses) does not indicate the architect, but the application for 35-37 Fairfield (also one application for two houses) names the architects as Ober and Rand. Bainbridge Bunting’s Houses of Boston’s Back Bay attributes all eight houses to Ober and Rand, which appears likely given the similarity of design. Click here for an index to the deeds for 38 Fairfield. On October 9, 1879, Asa Potter sold 38 Fairfield to Silas Merrill, and on the same day, he sold the property to Maria (Addison) Maynz, the wife of wholesale shoe and boot dealer Edward Maynz. They previously had lived at 12 Claremont Park. They continued to live at 38 Fairfield during the 1894-1895 winter season, but moved thereafter to Brookline. On May 1, 1895, 38 Fairfield was purchased from Maria Maynz by paper manufacturer Ellis Hollingsworth. In October of 1895, he married Elsie M. Littlefield and they made 38 Fairfield their home. They also maintained the Hollingsworth family home in Braintree and a home in Marblehead. The Hollingsworths continued to live at 38 Fairfield until his death in March of 1917. On September 20, 1919, 38 Fairfield was acquired from Elsie Hollingsworth by real estate dealer William J. Stober. On June 16, 1924, 38 Fairfield was purchased from the Robert T. Pollock Company by real estate dealer Paul Mascarene Hamlen. In December of 1925, he acquired 36 Fairfield as trustee under the will of William Powell Perkins, his mother’s uncle (Paul M. Hamlen’s parents were Nathaniel Perez Hamlen and Gertrude (Loring) Hamlen; Gertrude Loring’s parents were Francis Caleb Loring and Miriam Mason (Perkins) Loring, William Powell Perkins’s sister). On August 13, 1926, he transferred 38 Fairfield to himself as trustee under the will, and in October of 1927, he purchased 32–34 Fairfield, also as trustee under the will. Paul M. Hamlen purchased the property as an investment for the benefit of himself and his siblings. He and his wife, Agnes Dorothy (Devens) Hamlen, lived at 32 Gloucester and also maintained a home in Wayland. Under the terms of William Powell Perkins’s will, the income from the trust was to be paid to the four living children of Miriam (Perkins) Loring – Francis Caleb Loring, Jr., Anna Loring, Miriam P. Loring, and Helen Loring – and to the four children of Gertrude (Loring) Hamlen, who predeceased William Powell Perkins. The trust was to remain in effect until the death of the last surviving child of Miriam (Perkins) Loring, and then to be terminated. The principal was then to be distributed to the children of Gertrude (Loring) Hamlen, her siblings having been childless. On April 12, 1929, Paul Hamlen transferred 32-34-36-38 Fairfield to himself and his three sisters: Miriam Perkins (Hamlen) Warren, the wife of Edward R. Warren, Elizabeth Perkins Hamlen, and Gertrude Loring (Hamlen) Catlin, the wife of Daniel K. Catlin. On the same day, they transferred the property back to him as trustee under another trust that they had established in 1904 to manage income to them under the trust established by William Powell Perkins. On June 29, 1929, Paul Hamlen transferred the property to himself as trustee under the will of his grandfather, Nathaniel Hamlen, also established for the benefit of Paul Hamlen and his sisters, thereby consolidating their assets in one trust. Paul Hamlen converted 32-34-36-38 Fairfield into lodging houses, which he rented to others to operate. By 1933, 38 Fairfield was the home of Michael M. Ouspensky, a statistician for an insurance company, and his wife, Nina (Aurora) (Lindblad) Komarova Ouspensky, and the location of their restaurant, Jar Ptiza. They also operated a lodging house at 38 Fairfield. They previously had lived in Brookline. They continued to live and operate their restaurant at 38 Fairfield until about 1939, when they moved to 74 Symphony Road. 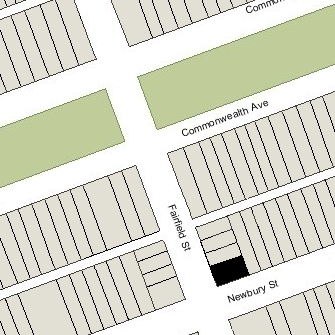 38 Fairfield is shown as vacant in the 1940 City Directory. By 1941, 38 Fairfield was the home of John Alfred Harrison, a court reporter, and his wife, Emma Dora (Cunningham) Harrison. They operated it as a lodging house. They previously had lived at 39 Huntington. 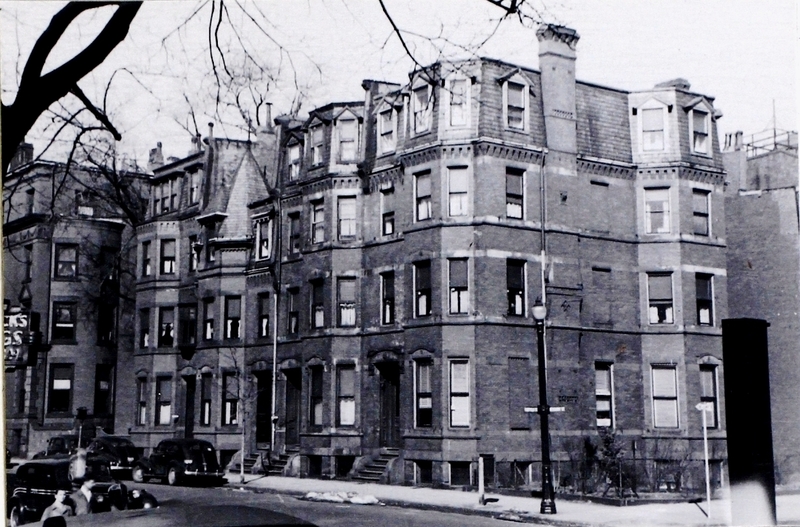 They continued to live at 38 Fairfield until about 1945, when they moved to 463 Beacon. Paul Hamlen died in July of 1939, and on August 19, 1944, his son, Nathaniel Hamlen, as the successor trustee under Nathaniel Hamlen’s will, transferred 32-34-36-38 Fairfield to the Warren Institution for Savings, which held the mortgage on the property. On August 30, 1944, the property was acquired by real estate dealer George T. Sullivan. On May 10, 1946, 32-34-36-38 Fairfield were acquired from George Sullivan by Joseph Francis Dinneen. He was a reporter with the Boston Globe, noted for his crime coverage and for his column on Boston’s night club scene. He also was a prolific author, Among his works was The Purple Shamrock, a biography of Mayor James Michael Curley published in 1949. He and his wife, Helen Agnes (Wagner) Dinneen, lived in Needham. In 1946, 38 Fairfield was the home of Adah DeWitt (Sanford) McMurrough, the widow of John Lawrence McMurrough, who operated it as a lodging house. She previously had lived in Norton, Massachusetts. By 1947, she had moved to 405 Beacon. 38 Fairfield remained a lodging house, with various operators, probably also with at least one commercial tenant. On August 20, 1956, 32-34-36-38 Fairfield were acquired from Joseph Dinneen by the National Realty Company (Charles Talanian, president; Thomas J. Diab, treasurer). On April 12, 1957, 32-34-36-38 Fairfield were acquired from National Realty by real estate dealers Stuart H. Hastings and Joseph A. Gautreau. They converted each building into eight apartments and then sold them separately: 32 Fairfield and 34 Fairfield to two different buyers, and 36 Fairfield and 38 Fairfield to a third buyer. On March 3, 1958, 38 Fairfield was purchased from Stuart Hastings and Joseph Gautreau by Helen (Helene) (Hios) Coste, the widow of Nicholas Coste. She had purchased 36 Fairfield from them in December of 1957. She lived in Jamaica Plan with her son-in-law and daughter, Harry (Aristides) M. Angelus and Despina Tessie (Coste) Angelus. They later all lived in Westwood. On June 22, 1962, Helen Coste transferred a half interest in 36-38 Fairfield to her daughter. Under their ownership, the buildings were converted into a combination of residential and commercial uses. An entrance to 38 Fairfield was added by the mid 1960s, and possibly before, with the address of 235 Newbury. By 1973, the legal occupancy of 36-38 Fairfield (235 Newbury) was as five retail stores, four offices, and eight apartments. In 1973, Harry Angelus applied for (and subsequently received) permission to build a two story addition, filling the area between the rear of 36-38 Fairfield and 231 Newbury. The addition subsequently became retail space with the address of 233 Newbury. In July of 1974, Harry Angelus filed for (and subsequently received) permission to add a beauty salon and restaurant. Helen Coste died in May of 1991. On October 16, 2002, Despina T. Angelus, individually and as trustee of the Helen Coste Family Trust, transferred 36-38 Fairfield to New Field Realty, LLC, of which she and her husband were the managers of record. On July 18, 2014, 36-38 Fairfield were purchased from New Field Realty, LLC, by the 207 NSR LLC (Serge Safar, manager of record). 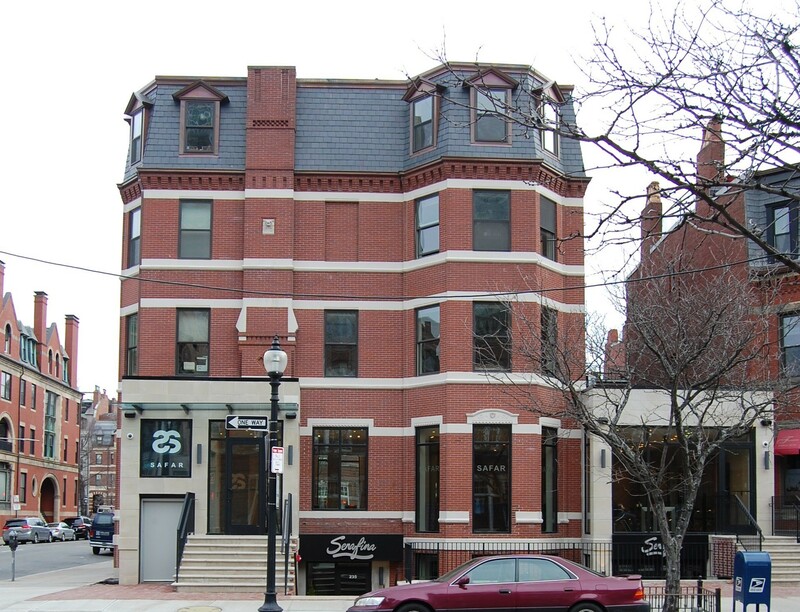 In July of 2017, 207 NSR LLC received approval to remodel 38 Fairfield (235 Newbury), extending the restaurant space on the ground level to include space previously occupied by the beauty salon (which relocated in the first floor of the building), installing new patio stairs and a new handicapped-accessible entrance bay, and squaring off the existing entrance bay. 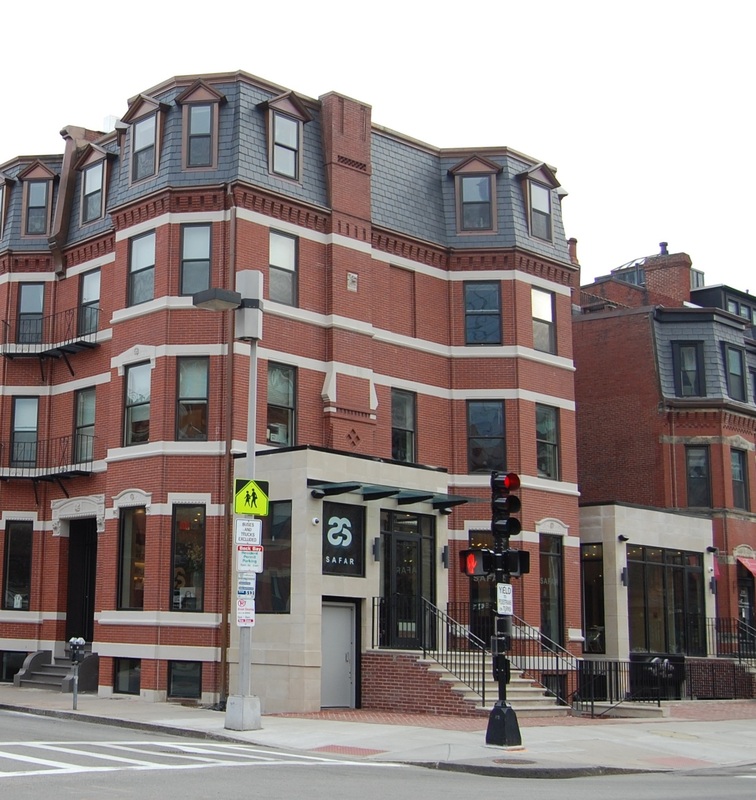 36-38 Fairfield (235 Newbury) remained a combination of a restaurant, beauty salon, retail stores, offices, and apartments in 2019.